It's that time of year when we remember the souls of our loved ones and everytime I remember you, I feel this stab of pain exactly how I felt, when I lost you. I am sorry that Mama can't be with you physically, but I know that you are happy where you are as you told me once in your dream. Mummy Lola has taken care of where you lay and has put a candle with flowers at your urn. I remember your hard fought battle against Leukemia, our days in PGH where we spent Christmas, New Year and including Valentine's day all in one confinement, your craving for Jollibee's Hotdog breakfast meal and your endless questions of why. Anak, Mama loves you so much. I miss you, you will never be replaced in my heart and I promise that I will see you, to smell your hair and hug you tight when the time comes. I wish you could meet your two siblings who have made your Mama complete once more and given me the chance to experience Motherhood once more. You taught me to become a better Mum. I will always remember the day when you told me "Alam mo Mama, masaya ako kapag kasama kita (You know what Mama, I'm happy whenever I am with you)." This is such a touching letter. I'm sure your son is happy where he is now. I just read your son's sorry and couldn't help but cry. I'm so sorry for your loss. 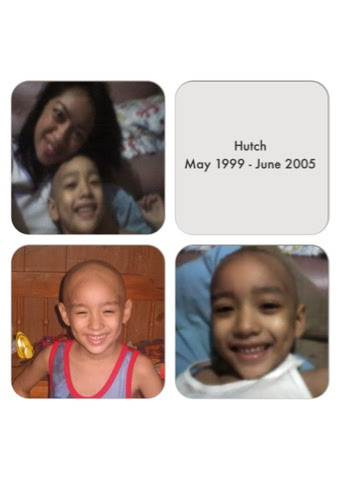 I'm a mom of three and can't imagine the pain you must have felt when you lost Hutch. I'm sure the pain will never go away and that you'll always miss him. But like you said on your website, there's a reason for everything. Praying for you and your family. Thank you Mommy Janice for reading his story. His story has touched many and I always share it to Mom's like us. Thank you also for your prayers. God Bless! OMG... I can't stop crying. It must have been so difficult. I really feel sorry for your loss. I want to say Thank you for sharing your thoughts. It was a great loss, I am just happy that he no longer suffers. Thank you again. I'm a mom as well and I am sorry about your son. God loves you, stay strong for your other kids. Thank you. One thing that Hutch taught me was to become a better Mother which makes my kids now very much loved indeed. I'm sorry for your loss. You've got an angel watching over you and your family for sure! God bless! Mommy Roxi thank you so much for your kind words, God speed! Thank you Mommy Kim, for giving time to read his story. It was so hard to get over but when I did, it made me realize a lot of things when it came to motherhood. I'm a mom who loss an angel too and I know how does it feel. Being strong for our other loved kids is what we are needed. I just read Hutch's story and I can't stop crying.. it's very heartbreaking.. and I can't even imagine all the pains that you both went through.. hugs sis.. Thank you for the virtual hug :) it means a lot to me. And your tears make me feel that nothing is as strong as a mother's love.